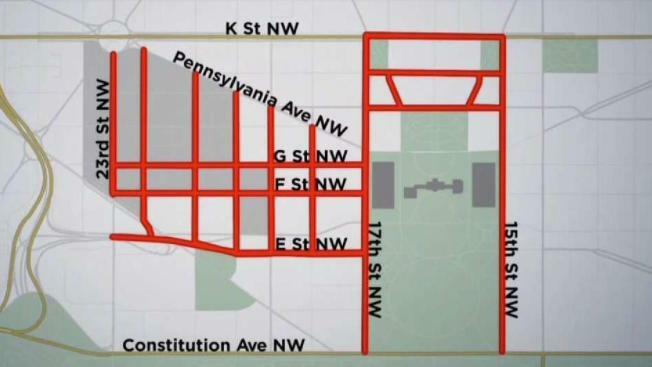 D.C. police closed multiple streets ahead of a planned white supremacy rally near the White House, with more groups counterdemonstrating. Police were planning in case violence breaks out like it did when the Unite the Right rally was first held last year in Charlottesville, Virginia, where a counterdemonstrator was killed. Rally organizers had expected 100 to 400 people to show up, according to a permit application. While the number of Unite the Right attendees turned out to be much lower, fewer than 30, hundreds of counterprotesters showed up. The Unite the Right rally ended before it was scheduled to begin, and many counterprotesters have appeared to disperse, but about 6:30 p.m. Sunday, Antifa was demonstrating in D.C. amid what appeared to be rising tensions with police. Map of street closures for Unite the Right rally. Closures and times could change as deemed necessary, authorities said. Drivers should obey emergency no parking signs. Cars parked along the route will be ticketed and towed.